The Iconfinder Pro subscriptions are designed for one user. 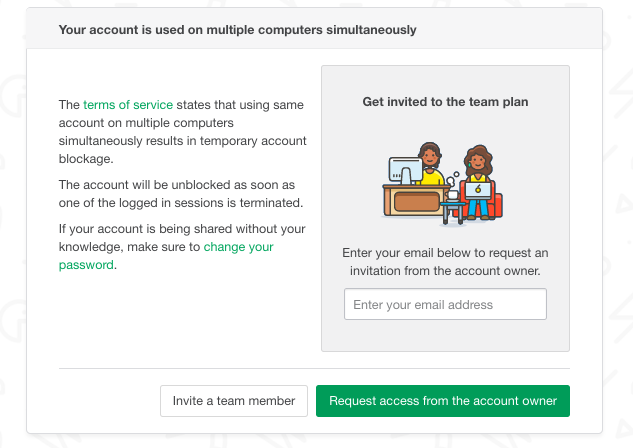 Sharing the account with a larger team can cause a temporary blockage of your account. If you are the account owner, you can invite your colleagues to your Iconfinder team plan. You can do that from Your account. Enter the email addresses of your team members to invite them to join your subscription plan. An invitation will be sent to their email address. The price for each additional team member is $19 and it will be billed monthly. Read more about How to add team members to your Iconfinder Pro plan. ❗ Note that the Team plans are only available for Pro Unlimited subscribers. If you are not the account owner, you will need to request access from the owner of the Iconfinder account. Enter your email address and click Request access. An email will be sent to the account owner's email address. You will be notified once your request has been approved by the account owner. In case you have not shared your account credentials with anyone, your account might be compromised. Make sure to change your password.